In around 1130, Archbishop Konrad of Salzburg established a canonical foundation of the Order of St Augustine in place of an 8th-century Benedictine monastery. It was later redesigned in the baroque style and was dissolved in 1803. King Ludwig II acquired the island in 1873 as the site of his new palace and established his own private quarters in the so-called Convent Tract (east wing) of the monastery. The king's rooms are part of the museum. 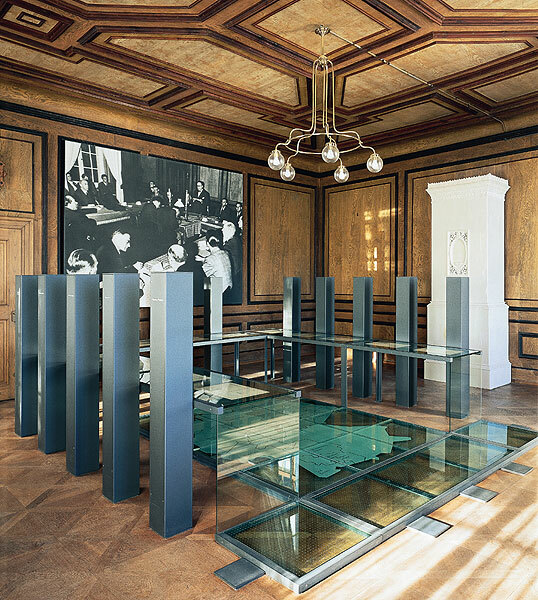 In 1948 the Constitutional Assembly met in the dining room to draw up the Grundgesetz (constitution) for the Federal Republic of Germany. "The Birth of a constitution"
However, "From the monastery to the king's palace" and "The Birth of a Constitution" – both located in the Convent Tract (east wing) – are only two parts of the museum. 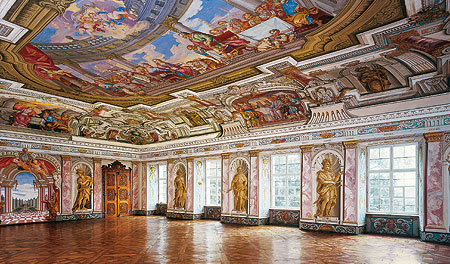 On the first upper floor of the Convent Tract is the Maler am Chiemsee Gallery, and in the Princes' Tract (south wing) the magnificent Imperial Hall, the Garden Room and the Court Kitchen can be seen. 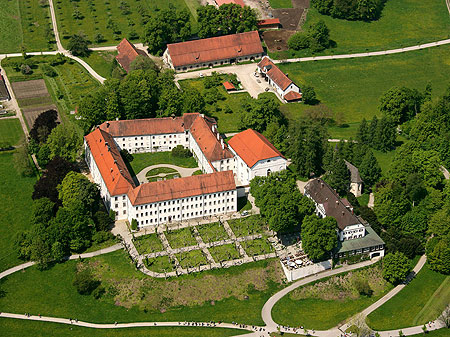 Besides, in the Prelacy Tract (north wing) the monastery complex houses the Julius Exter Art Gallery. North of the Augustinian monastery (Old Palace) is the former parish church of St Maria, a late-Gothic building redesigned in the baroque style with a remarkable coffered ceiling installed in 1630. In front of the monastery seminary dating from 1740, which is today a restaurant, is the "Plane Tree Grove" planted in 1893, from which there is a splendid view of the Fraueninsel. The Library Hall is suitable for chamber concerts and small conferences up to 99 persons. Combination ticket "Island" including the exhibition "Königsklasse IV"
"Chiemseebahn" (in summer) or bus (in winter) to "Schiffsanlegestelle Prien/Stock"